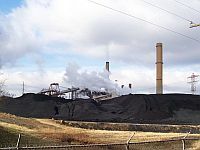 Coal-fired power plant in central Virginia, U.S.
Oct 2 (IPS) – As global warming melts the Arctic, the United States’s biggest banks are investing billions of dollars in as many as 150 new coal-fired power plants around the country. The obvious climatic and fiscal stupidity of such investments is staggering, say environmentalists. “What are they (the banks) thinking?” asked Leslie Lowe, energy and environment programme director at the Interfaith Centre on Corporate Responsibility. Carbon regulations are coming, and profiting from the destruction of nature and communities is immoral in any case, Lowe told IPS at a press conference. Carbon regulations are coming, and profiting from the destruction of nature and communities is immoral in any case, Lowe told IPS at a press conference. “It is folly to build new coal-fired plants,” she said. And yet that is just what Bank of America and Citi (formerly Citigroup) are doing, according to the new report “Banks, Climate Change & the New Coal Rush” by the Rainforest Action Network (RAN). The 150 proposed new plants would add 600 million to 1.1 billion tonnes of carbon annually into the atmosphere, Tarbotton said in an interview. Total global emissions of carbon are currently about 8 billion tonnes. “There is no hope of averting climate catastrophe if a significant number of those plants are built,” said Bill McKibben, author and founder of Step It Up, the largest demonstration against global warming in history. “Climate change is already happening much faster than anyone expected,” McKibben told IPS. In the past two weeks, reports that the Arctic ice cap shrank dramatically this summer have left scientists shocked at the speed and extent of the melting. The Arctic Ocean may well go from white to blue in less than a decade, some believe. The ramifications of an ice-free Arctic on the world’s weather system and the local ecology have yet to be determined. Coal currently supplies approximately half of the U.S.’s electricity and produces 80 percent of the sector’s CO2 emissions. Building new coal-fired plants — which have projected lifespans of 50 years — would undo virtually any and all domestic efforts to reduce carbon emissions, notes McKibben. RAN and the coalition of environmental and faith-based groups, as well as Al Gore, Senators John Edwards and John Kerry, and Senate Majority Leader Harry Reid, are calling for a moratorium on all new coal-fired plants. “I can’t understand why there aren’t rings of young people blocking bulldozers and preventing them from constructing coal-fired power plants,” former U.S. vice president and prominent global warming campaigner Al Gore was reported as saying by the New York Times last August. “It’s (also) financially ludicrous to be backing a 19th century technology rather than 21st century technologies,” McKibben said.